I thought I'd have to wait for today for temps to finally become tolerable, but I was pleasantly surprised when I got off work last night and my car dash read 35 degrees. Unexpected, but certainly not unwelcome! 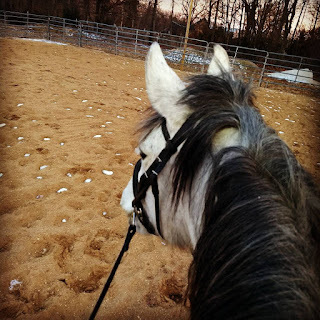 I didn't let myself get too excited about riding until I got home and checked the footing in my arena -- I was concerned the snow from Sunday and then freezing rain from earlier this week might have melted into slop, but it was perfect. 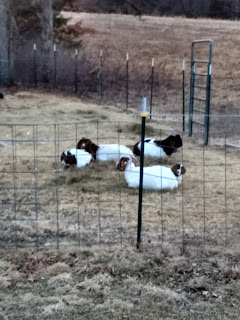 Random snow pockets, but otherwise great! Continuing with my plan to alternate riding the girls, I grabbed Cinna from turnout and tossed her in the crossties. She's getting so personable and really maturing lately (FINALLY). She definitely still has dumb baby moments, but I'm starting to be able to trust her more. 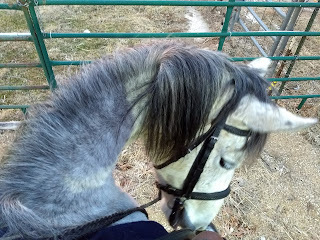 She no longer attempts to vacate the area every time I bridle her, which is so appreciated haha. DH called as I was finishing tacking up, so I told him I'd be riding Cinna (I figured he'd get home right about the time I was finishing up). His call actually distracted me so much that I walked her out to the mounting block without my helmet and had to backtrack to go get it. She stood like a rock at the mounting block while I fiddled with my gloves and phone holder (also a new appreciated habit we've worked on! ), and I climbed on. She flicked an ear when I first turned some music on, but she settled right into work. For the warm up we just focused on walking and bending. 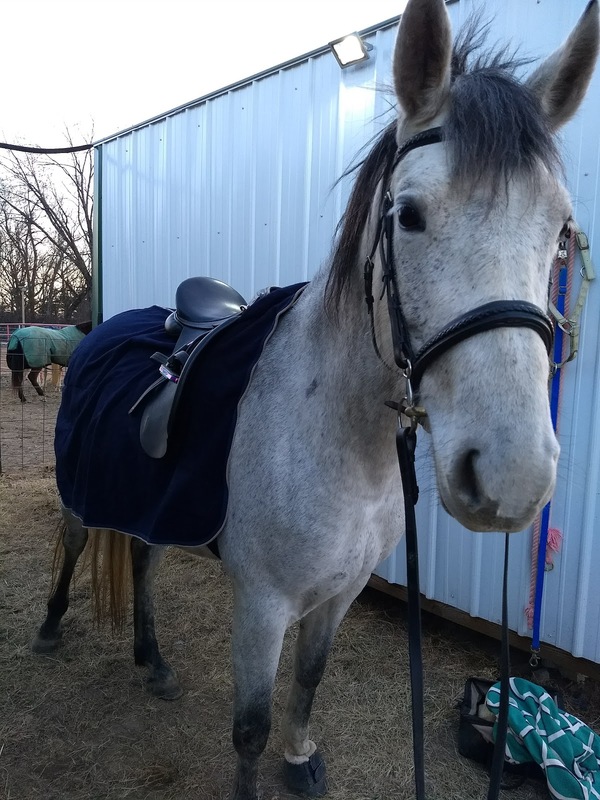 Once we were ready to trot, I tried to make sure I was riding at "neutral" and let her do her own thing as long as she maintained a steady tempo. More than once she wanted to get rushy, but she accepted half halts politely and would return to the tempo I wanted. 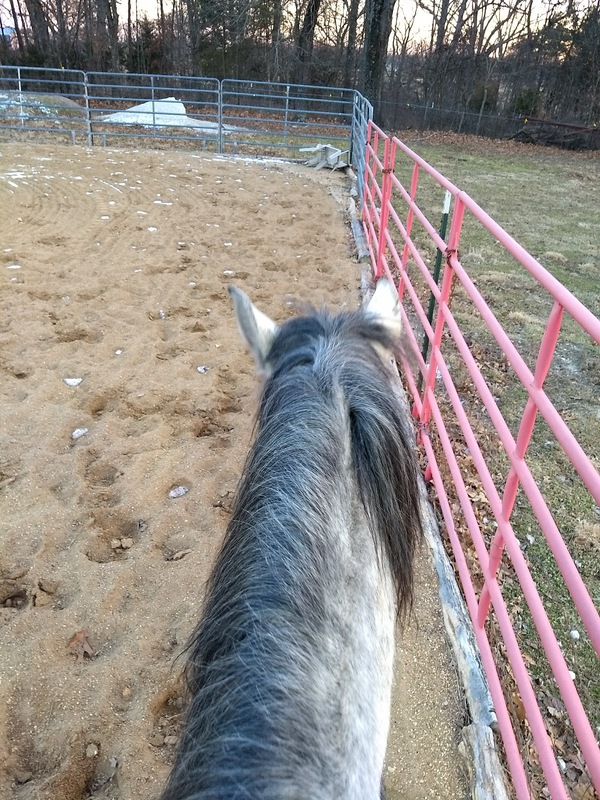 She was pretty active in the mouth, even though I switched back to the bit she normally prefers for this ride. It is about time for our annual vet visit with floats, so possibly she's experiencing some teeth discomfort. Too tired to play king of the shed, thankfully. 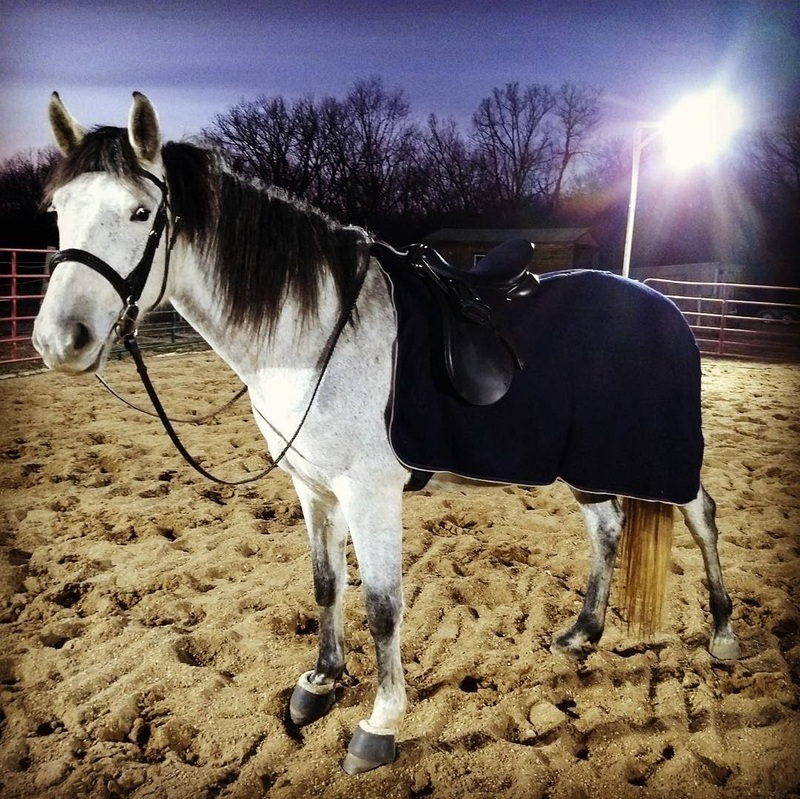 She was super good to canter, and we didn't have any hint of that sticky "can't bend to the right so I'm gonna plow into the fence" nonsense. She did get a bit tired the second direction (right) and broke to the trot once, but picked the canter right back up when asked. I rode through a few test elements from intro, and we had some good moments and some horrifying moments, lol. We need sooooo much work on centerlines. All of the work. We cannot trot a straight line off the rail to save our lives. But the transitions are coming along and she let me adjust the circles very well. We also worked on the free walk a bit, and really stretching down and lengthening her steps. 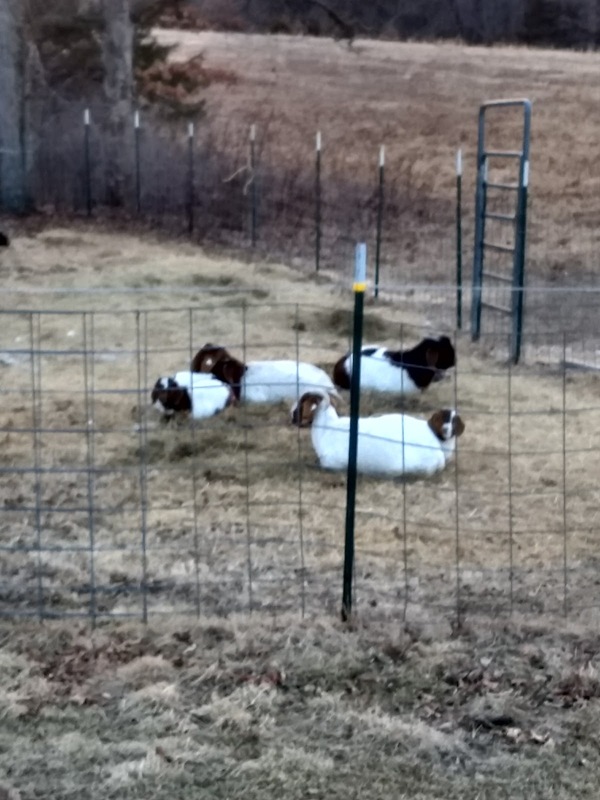 She's very much like her mother in that when she gets excited, she reverts to the stereotypical Spanish sewing machine gaits, so relaxation and covering ground are going to be perpetual works in progress. "Good girls get cookies, yes?" We also worked on some stretchy trot for the first time. Midway through the ride she reached into the bridle really well so I lengthened my reins a little to see if we could stretch further -- and she zoomed off, haha. But later in the ride she offered again, and this time she truly stretched down without increasing the tempo. We had bobbles, to be sure, but even after she'd pop up, I could shorten the reins, ask again, and she'd try. 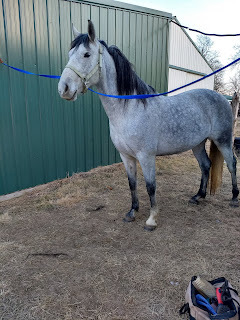 I rode for about 40 minutes and was super pleased with both her attitude and the quality of some of the work, so I decided to cool out we could walk a bit in the pasture. Phone did not even begin to do this justice, it was gorgeous. I'm not sure why I keep thinking that's a good idea, but I need someone to slap me upside the head next time the thought crosses my mind. She was fine walking out (a little spooky and prone to stopping), but totally manageable. 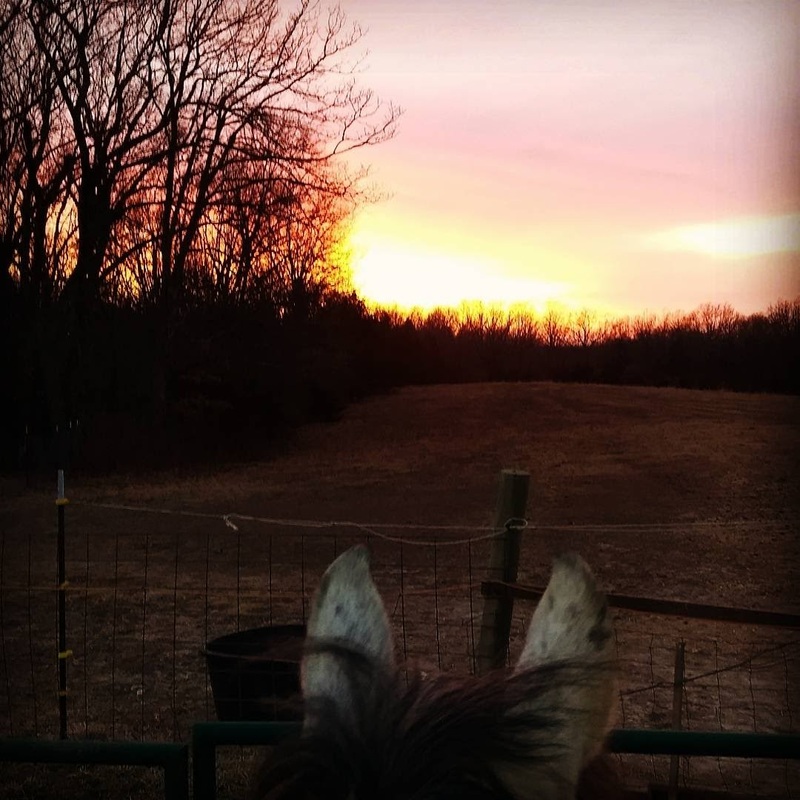 However when I turned her around and started walking back to the barn, all hell broke loose and she lost her mind. 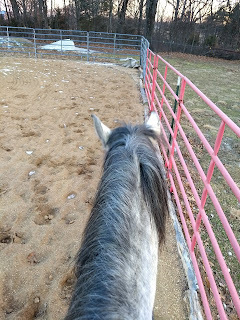 We quickly surpassed my "safety switch" in that she became more dangerous than I was comfortable with in a non-enclosed area riding alone, so I dismounted and then we worked in hand. She started very bargy and concerned, but she gradually relaxed until I was hand walking her with slack reins. Obviously getting off wasn't my first choice (as I don't want her to think misbehaving gets her out of work), so we walked back into the arena and I mounted up again for some more walking. I had already cooled her out so I didn't want to do anything complicated, so we just worked on halting from my seat. 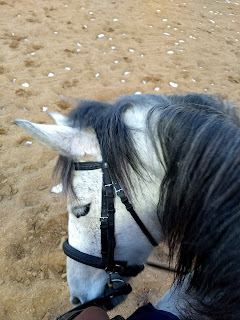 By the end of the ride I was holding the reins on the buckle while we did multiple walk - halt transitions. Minus the bobble in the field, I was super pleased with the ride. It's hard to maintain any consistency in the work right now, but she always comes out trying and retains the lessons from ride to ride, so I really couldn't ask for anything more! (Well I mean, if someone wanted to build me an indoor, I wouldn't turn it down, but aside from that ;) haha). Hey - centerlines are hard ok, lol! haha straight lines are hard period! Yay for stretchy trot! 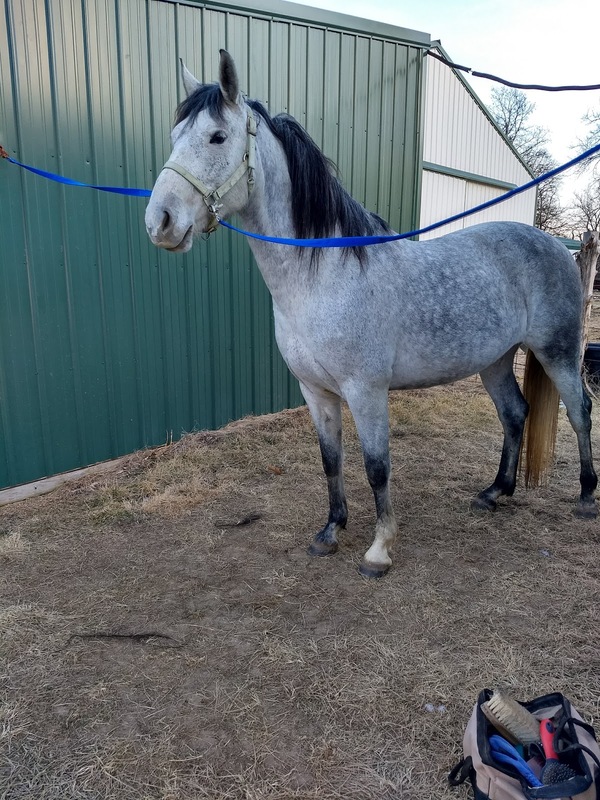 Dante and my last horse Ramone fell in love with stretchy trot once they realized what it was. Ramone especially would start to ask to do it a lot. Haha. I dunno I don't think you are crazy, you are obviously getting comfortable with Cinna and all she does so you are pushing the envelope (at least that's how I feel when I do new stuff with Dante- like practicing opening and closing gates). My aversion to riding in the pasture more stems from it being an absolute disaster for both her and Ruby within the last week 😂 but we'll get there. You're absolutely dead on that we're getting more comfortable together and that I'm pushing the envelope more 🙂 developing our partnership is fun now that we're getting a little past the "put a ride on the baby and don't die" more into the "actually teach the baby things" territory haha. Haha well one of my goals for 2018 (not that I ever got around to writing those out haha) was to track every work session. I meant to do it in a journal, not here, but the journal is apparently lost in transit. Oh, mares. Always have to do something dramatic after being perfect. ;P Glad that most of the ride went so well! Aw she's starting to grow up.